Eklavya Model Residential School Scheme was started in 1998 and first school was started in the year 2000 in Maharashtra. A total of 259 schools have been sanctioned during the last 17 years, out of which, 72 EMRS were sanctioned during last three years. 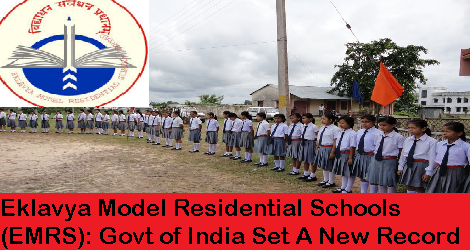 New Delhi 13 May 2017: Ministry of Tribal Affairs has actively initiated various efforts during the last three years to make more Eklavya Model Residential Schools (EMRS) functional. As a result, 51 new EMRS were made functional during the last three years. 161 EMR Schools are functional right now, while this figure was at 110 in the year 2013-14. More than 52 thousand tribal students are taking education in 161 EMR Schools of 26 States. Eklavya Model Residential School Scheme was started in 1998 and first school was started in the year 2000 in Maharashtra. A total of 259 schools have been sanctioned during the last 17 years, out of which, 72 EMRS were sanctioned during last three years. EMRSs have been functioning as institutions of excellence for tribal students. Results of these schools have been generally better than other Government schools in the tribal areas. Average pass percentage of students in Class Xth and XIIth in these EMRS is above 90%. Many EMRS students have been reported to be faring well in higher studies and competitive examinations. In order to further educational opportunities for more ST children, Government seeks to extend the facility of EMRSs in all the 672 Blocks where ST population is more than 50% of the total population in a span of next five years. As per existing EMRS Guidelines of 2010, at least one EMRS is to be set up in each Integrated Tribal Development Agency (ITDA) / Integrated Tribal Development Project (ITDP) having 50% ST population in the area. The capital cost for setting up the school complex, including hostels and staff quarters etc. has been earmarked at Rs. 12 crore with a provision to go up to Rs.16 crore in hill areas, deserts and islands. Recurring cost during the first year for these schools would be Rs. 42000/-per child, with a provision of raising it by 10% every second year to compensate for inflation etc. No. of Eklavya Model Residential Schools (EMRS) functional, 161 EMR Schools are functional right now, 51 new EMRS were made functional during the last three years, Recurring cost during the first year for these schools would be Rs. 42000/-per child, with a provision of raising it by 10% every second year to compensate for inflation etc.